I am lucky enough to work in an office full of people my age who are fun to be around. There are about nine of us who take turns brining in breakfast on Fridays. Today was my “breakfast club” day and I pulled some inspiration from Pat and Gina Neely’s Breakfast Sandwich and created a crowd pleaser. Preheat the oven to 425 degrees and line a baking sheet with parchment. Fry the bacon over medium high heat until cooked and a little crispy. Whisk together the flour, sguar, baking powder, and salt in a medium sized bowl. Add the cream, bacon and cheese and stir with a wooden spoon until dough comes together. Remove dough from bowl and knead on a flour dusted counter top until smooth. Pat the dough out to a 1-inch thickness. Use a floured biscuit cutter to create biscuits and place on baking sheet, keep kneading left over dough and creating biscuits until you run out. In a small bowl mix egg and 1 tbl of cream, arrange biscuits on parchment lined sheet and then brush with egg mixture then sprinkle with kosher salt. Bake immediately for 18 minutes. 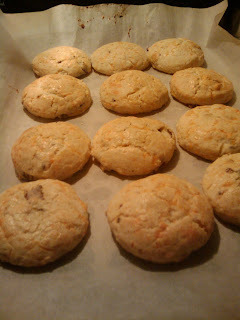 The biscuits can be refrigerated over night in a zip top bag and warmed the next morning on a baking sheet covered with a moist kitchen towel; this is what I did and they were still great. This was the first time I had made biscuits without my Grandmother’s help. A word to the wise – 1 inch is thicker than you think. Don’t pat the dough out too thin, or like me, the biscuits will come out looking a little more like cookies than biscuits. But don’t worry, even if this happens they will still taste good! I served the biscuits with eggs lightly scrambled over a medium flame. I used 15 eggs and right before I took them off the stove I stirred in about 3 tbl of fresh chopped chives. 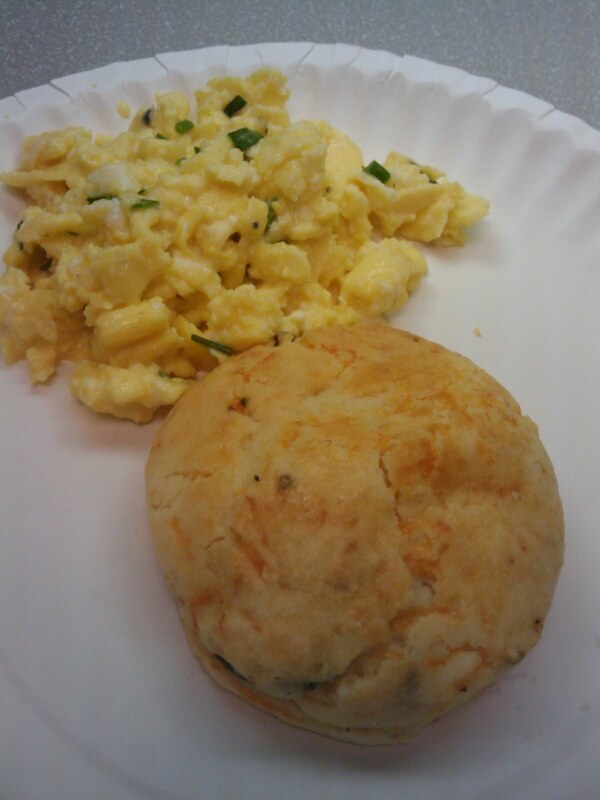 The gooey runny eggs went perfect with the cheesy bacon biscuits! If you are cooking for a smaller crowd, half the bacon recipe and scramble 1-2 eggs for each guest you are serving.